When the air is hot and the sweat is palpable, the first thing on most peoples' minds is cooling down in a swimming pool. Relaxing in that refreshing water is a rite of passage on hot days and many folks look forward to the activity all year long. These tips for cleaning your swimming pool will keep the water clear and welcoming. If your pool is less than clean, it's not exactly an enticing invitation for swimmers to enter. Fortunately, there are many tools that can make outdoor living more comfortable and convenient and allow your to clean your pool with ease. Maintenance on your pool is simple and easy, if you know a few tips for cleaning your swimming pool. Perhaps the most important tip is to not do all of the work yourself, that is, enlist the help of products to make cleaning your pool easy and efficient. These products can likely perform a better job than you could by yourself, and also make it much more simpler. Fortunately, there are many tips for cleaning your swimming pool and a variety of tools to help with the job. Tired of seeing leaves and other debris hanging out in the bottom of your pool? Use a pool cleaners - like a rechargeable, cordless pool vacuum - to scoop up the mess and leave your pool bottom sparkling clean. If it seems as though you can never get your pool water to look completely spotless, perhaps it is due to a dirty pool filter. Instead of doing a mediocre job cleaning the filter with a standard hose nozzle, try a pool filter cartridge cleaner, which sends directional streams of water to fit and clean in between the pleats in the filter. 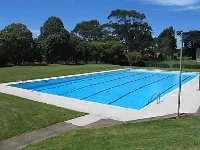 Pool chemistry can also play a large part in the cleanliness of your pool. If certain chemicals in the pool aren't at their appropriate levels, algae and other material can affect the water. Take the guess work out of the levels in your pool by using a pool chemicals and a water chemistry monitor. This handy device tests and monitors the levels of the pool using a floating sensor. Its findings are then transported to a monitor in your home, allowing you to keep watch on your pool's chemistry levels all from the comfort of your couch. Eco-friendly pool owners can use environmentally conscious and effective pool maintenance techniques. Alternatives to chemicals include ozone, filtering and circulation. Cover your pool when its not in use to keep debris and other objects out of the water. Solar covers can also help to bring the temperature of cool water up. While a clean pool is desirable, a stylish pool, surrounded by an attractive outdoor living area, is even better. Make your pool the coolest spot on the block by adding flavor to your water oasis. Pool decorations, such as underwater lights and pool floor mosaics give your pool a unique touch and entice all to enter. With a clean, decorative pool, you can relax, refresh and revitalize your body, senses and mind.